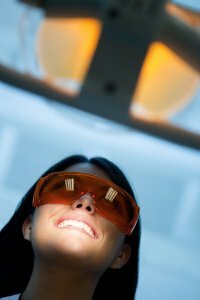 Laser dentistry is becoming more common in dental clinics across the country. This technique first gained momentum in the United States in the early 1990s, when it was approved for use by the country’s Food and Drug Administration. In 1996, the FDA approved laser use on the teeth, jawbone, and other hard tissue areas in and around the mouth. Since then, dentists have used lasers to provide a variety of treatments and services to patients. You might be able to choose laser dentistry for your next dental procedure, depending on the nature of the issue as well as the severity. Laser dentistry is commonly used for procedures such as tissue biopsy, tumor removal, and soft tissue reshaping. Many dentists can also use lasers to detect cavities, prepare fillings, lengthen crowns, and even whiten teeth. Laser techniques have provided many benefits to many medical fields and their patients. Laser dentistry is no exception! This technique can reduce or eliminate the need for anesthesia and stitches. It can also minimize bleeding, bacterial infections, and damage to the surrounding tissue and often results in faster healing time. Many patients can benefit from laser dentistry as it works for many different types of dental procedures. This option can be highly beneficial for patients with dental anxiety who fear undergoing traditional dental surgery and treatments. If you think you can benefit from laser dentistry, talk to your dentist about your options. Your dentist can answer any questions you have and help you have the best experience possible!